Researchers and scientists alike agree that we’ve ignored how essential gut health is to our overall health. And guess what our Standard American Diet (SAD) hits the hardest? Our intestines. GMO’s, processed and refined foods strip down the gut of good bacteria, creating an inflammatory reaction that has produced an epidemic of Crohn’s disease, Celiac, and other inflammatory problems as well as causing weight gain. Many of the food inventions of our brave new world are horrible for our bodies. Modern medicine is just too damn smart for its own good, or for our good that is. With all of our wonderful advances through pills, science, and surgeries, we completely ignore holistic health guidelines that have been around for thousands and thousands of years. We seem to think the body incapable of healing itself without the aid of Western medicine. While I don’t think it’s advisable to wholly use natural health alternatives, I think it’s wise to learn what we can and implement simple and yet powerfully effective measures. Remember, just because something is “natural” doesn’t mean it’s healthy. A tornado is natural, but I’d rather stay clear. Still, it’s interesting that our fabulous, modern medicine is now just starting to catch up with Eastern medicine. Researchers and scientists alike agree that we’ve ignored how essential gut health is to our overall health. And guess what our Standard American Diet (SAD) hits the hardest? Our intestines. GMO’s, processed and refined foods strip down the gut of good bacteria, creating an inflammatory reaction that has produced an epidemic of Crohn’s Disease, Celiac, and other inflammatory problems, as causing weight gain. Many of the food inventions of our brave new world are horrible for our bodies. For instance, Splenda is known to wipe out the normal flora (good bacteria) of your gut. Healing the gut is important to our overall health and well-being. The first way to do that is to abandon the standard American diet and restore balance. Body: Intestines that don’t have enough good bacteria get overrun by the bad, which leads to all manner of problems ranging from weight gain, bloating, sugar cravings, Irritable Bowel Syndrome, mood instability, and so many other problems. 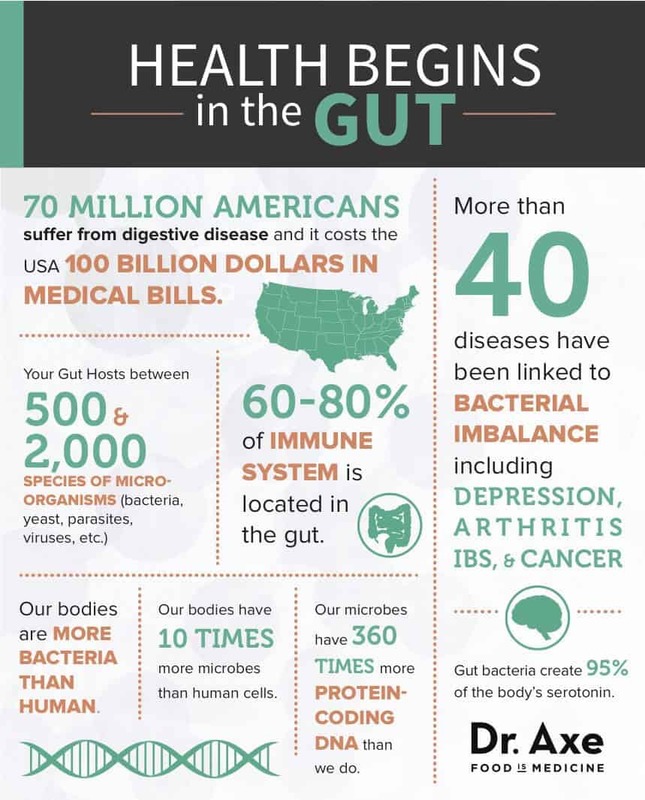 It’s important that you realize the impact your gut health has on every single part of your body – physical and mental. Mind: 95% of your serotonin (the neurotransmitter responsible for making you feel happy) is in your gut. This is such a powerful mood stabilizer, that many psyche meds fight depression by way of trying to force the body to produce more serotonin or spare the serotonin being made. Healing the gut is important to our overall health and well-being. The first way to do that is to abandon the standard American diet and restore balance. Dr. William Davis is now famous for exposing the incredible nutritional blunder being made by “official” health agencies: Eat more “healthy whole grains.” The wheat of today is different from the wheat of 1960, thanks to extensive genetics manipulations introduced to increase yield-per-acre. Founder of the international online program for heart health, Track Your Plaque, his experience in thousands of participants uncovered how foods made of wheat actually CAUSED heart disease and heart attack. Eliminating wheat yielded results beyond everyone’s expectations: substantial weight loss, correction of cholesterol abnormalities, relief from M.S., Parkinson’s and inflammatory diseases like arthritis and Lupus. The Second way to heal your gut is to take a good probiotic every day. Make sure the one you select has numerous strains and can remain stable at room temperature. Likewise, a good time-released pill can increase the probiotic’s potency. Many good bacteria strains will die at room temperature. Take your probiotic as recommended, which might sound quite basic, but I assure you the overwhelming majority of people pop pills without reading directions. What exactly will probiotics do? Want to dive in deeper? Head over to Holistic Living to learn more.